The city has set up times and locations for protests of the Democratic National Convention. Activists say they should be permitted to gather anywhere they please. Activist Cheri Honkala argues against the city's planned shut down of rush hour protests during the upcoming Democratic National Convention. Make no mistake about it, there will be protests in Philadelphia during the Democratic National Convention from July 25 to 28 at the Wells Fargo Center in South Philadelphia. 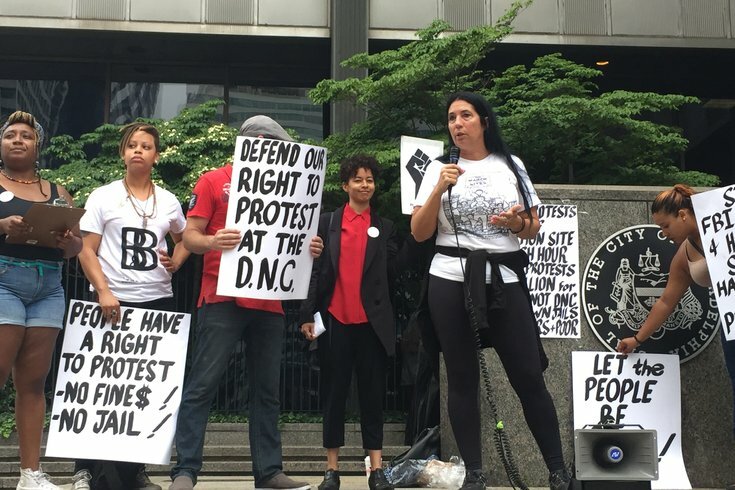 But protesters from a variety of groups gathered Tuesday at the One Parkway Building, at 1515 Arch Street, to denounce the city's ban on protests during rush hour – no gatherings allowed in Center City from 7 to 9 a.m. and 3 to 6 p.m. – and call for a shutdown of the DNC. "We are angered by the coordinated assault on our right to protest," said organizer Erica Mines, a Philadelphian activist who sparred with Bill Clinton during a recent visit to the city. "We plan to march no matter what the city says." The protesters aimed their ire at the city's Office of Special Events, which has yet to approve a permit for a pair of marches – the Black DNC Resistance March Against Police Terrorism and State Repression and the Shut Down the DNC March – that organizers plan to hold on Monday, July 25, the first day of the convention. According to protest organizer, Scott Williams, the organizations submitted requests for permits from the Office of Special Events 12 days ago, and they have not heard back. "We want to ensure our rights are protected," Williams said. The planned Shut Down the DNC March is expected to draw up to 3,000 people, and Williams said that, with or without permits, the protesters will march down Broad Street, from City Hall to the Wells Fargo Center. The city has set aside part of FDR Park, near the Wells Fargo Center, for protests, but Williams said, putting protesters in a designated place defeats the purpose. "They don't want people to know that we don't support the Democratic Party," said Williams. "We are calling your bluff and we are going to march on you, and it's going to be a powerful show." 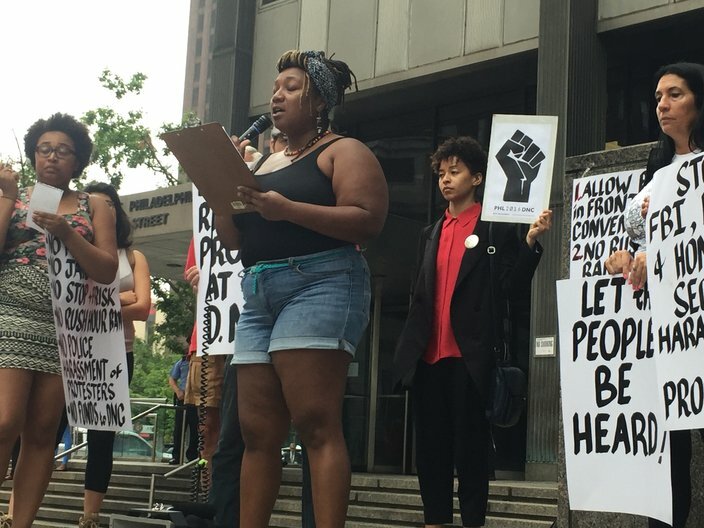 Activist Erica Mines promises a gathered crowd on Tuesday that protestors plan to march against the Democratic National Convention even if they can't secure the required permits. Members of at least 14 different organizations – including the MOVE Organization, the Philadelphia Coalition for Racial, Economic and Legal justice, the Black and Brown Workers Collective, and others – attended Tuesday's rally to call attention to four main issues. "You say you have no money, but you have money for partisan politics," argued Deandra Jefferson, a 23-year-old protester. "We want our $60 million back." Earlier this month, however, Ed Rendell, chairman of the Democratic National Committee in charge of raising funds for the convention, said the group is just short of the $60 million goal of corporate contributions and donations. But that funding is not Philadelphia taxpayer money. Mary Catherine Roper, deputy legal director of the ACLU of Pennsylvania, said Tuesday that protesters should have the right to have their voices heard during the DNC, while Philadelphia defense attorney Larry Krasner promised to defend the rights of any and every individual arrested for protesting without a permit. Krasner reminded the crowd that women only gained the right to vote after protesting in front of the White House over a century ago. "You are ungrateful to your traditions, City of Philadelphia... if you don't admit whose shoulders you're standing on," he said. In fact, the ACLU has sued the city over the ban on rush hour protests. Cheri Honkala, an activist who is planning the March For Our Lives protest at City Hall, said protesters are tired of the city's "games". "We are so beyond disgusted at the games that the city has been playing," she said, including the city's request of the group to schedule a meeting to discuss its concerns. Honkala also is planning to host "reality tours" for DNC delegates, to show them what life looks like for underprivileged Philadelphia residents. She said they would tour Kensington and North Philadelphia neighborhoods, to show examples of how difficult life can be for the poorest in the city. "We will show you what it's like to have a house that doesn't have water, that doesn't have electricity," she said. As Tuesday's rally came to a close, protesters in attendance chanted "no justice, no peace." "This is about power, people power, and that's why we march," said Mines.